More than 15,000 unsafe hoverboards - otherwise known as self-balancing scooters - have been seized at ports and airports around the UK. Trading Standards officers said the boards were in danger of overheating, exploding or catching fire. 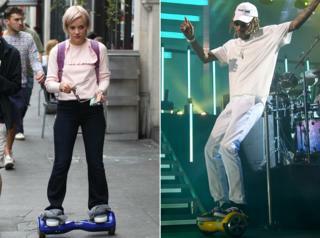 Hoverboards, which are popular with celebrities including Lilly Allen, are expected to be big Christmas sellers. The London Fire Brigade said at least three house fires were caused by such devices over 10 days in October. Many have plugs without fuses, faulty cables or chargers that can burst into flames, according to Trading Standards. It said that 88% of the hoverboards it seized around the UK were found to be defective. Most were discovered at the Suffolk port of Felixstowe, but others arrived at East Midlands airport and in Glasgow. The faulty devices are thought to have come from East Asia and China and do not conform to European safety standards. Most are not branded and have been ordered by websites or small traders to sell on to bargain-hunting shoppers. "We suspect that most of these products are being imported for onward sale domestically as Christmas approaches. We urge consumers to be on their guard when purchasing these products," said Lord Harris, the chair of National Trading Standards. Consumers are being advised, as a minimum, to check that the three-pin plug conforms to BS 1363. Safety laboratories have been so busy testing suspect products that they have had to take on extra staff. Never leave the device charging unattended, especially overnight. A faulty cut-off switch means it could overheat. Check the plug. Many faulty devices have a "clover-shaped" plug. If buying online, be careful to check the website is genuine and has a contactable phone number and address. Don't be dazzled by prices which seem too low. "Consumers should not let a new fashion or craze cloud their judgement and remain vigilant at all times," said Leon Livermore, chief executive of the Chartered Trading Standards Institute. Trading Standards officers in Salford, Greater Manchester, seized 90 hoverboards last month, citing similar safety worries. Fires have also been reported in the US, Australia and Hong Kong. Hoverboards are so called because of a similar device seen in the 1989 film, Back to the Future 2. But it is illegal in the UK to ride them on pavements, or on roads. They can only be used on private land. Anyone who finds such products for sale is being urged to contact the Citizens Advice helpline, on 03454 04 05 06.